CLOSE YOUR EYES and imagine you’re in Genoa, the city in the north-west of Italy where Christopher Columbus was born. On one side of the street you’ll find the Lanterna, the famous lighthouse which has become the symbol of the city. On the other, you’ll see the harbour from which it all began. It’s a harbour that has always connected the city to the rest of Europe and ultimately allowed it to create the first society of a sport that unequivocally changed the culture of the entire country. This is the city where Italian football was born and from which it spread out. From that moment on, Genoa has been split into two vastly different souls: one symbolised by the Griffin and the other by the Sailor. Welcome to the world of Genoa and Sampdoria. Genoa were the first team in calcio history and have the unique honour of being the only Italian team to have won a league championship in three different centuries. Founded in 1893, they bagged nine Scudetti from 1898 to 1924 and one Coppa Italia in the 1936/37 season. From the Second World War, the history of Genoa has been characterised by countless ups and downs, with the club flitting between the top two tiers in Italian football, even spending some time down in Serie C1. It’s a club which has tested the patience and loyalty of its fans but has come through with flying colours each time. 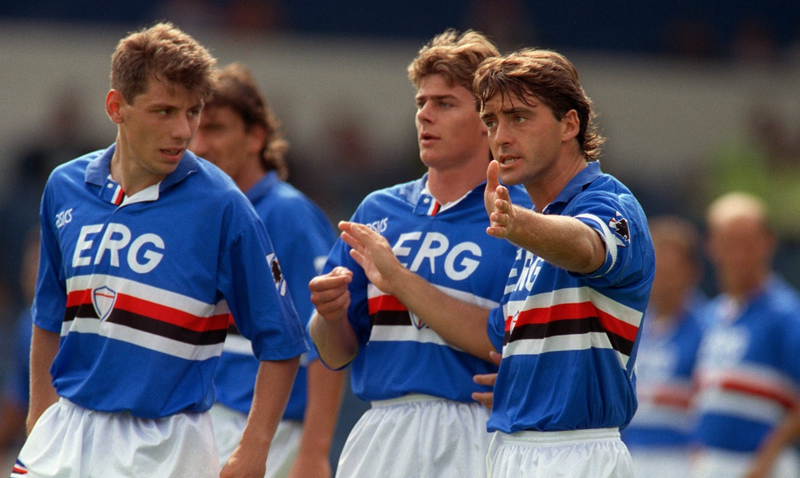 The birth of Sampdoria is in marked contrast to their fierce city rivals. Established in 1946 thanks to the merger between two local teams, Sampierdarenese and Andrea Doria, it was through this union that the name Sampdoria was born. I Blucerchiati enjoyed their best years during the mid-1980s and mid-90s, winning their first and only Scudetto in the 1990/91 season, four Coppa Italia, one Supercoppa Italiana and one Cup Winners’ Cup. The two-year golden period of the city’s football was between 1990 and 1992, when both teams demonstrated their value in Italy as well as in Europe. In fact, during the first of these two magical years, Samp won the Scudetto and Genoa finished the championship with a memorable fourth-place finish. Life had never been so good in Liguria. The next year, Samp reached the European Cup final against Barcelona and Genoa were eliminated in UEFA Cup by Ajax in the semis. It was a boom time for the city’s football, with the clubs characterised by their world-class offensive lines: Tomáš Skuhravý and Pato Augilera starred for Genoa, while Gianluca Vialli and Roberto Mancini – known as Gemelli del Goal (The Goal Twins) – starred for Samp. 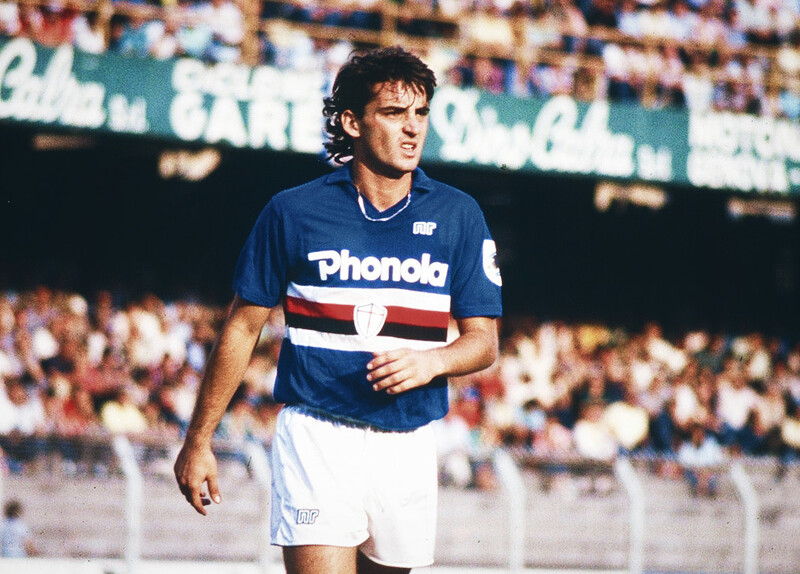 Sampdoria’s chosen kit colours place a great deal of emphasis on their history. Boasting a royal blue with circled trims of black, white and red, they reflect the union of Sampierdarenese and Andrea Doria. It’s this reason why they’re called Blucerchiati – the Italian for Blue and Encircled. On the other hand, Genoa’s colours are red and blue, chosen to celebrate the Anglo origins of the club. 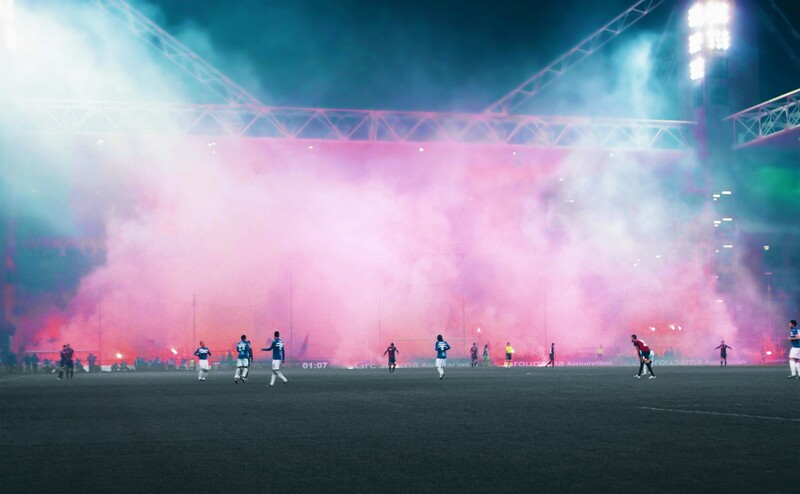 That’s why Genoa supporters are called Rossoblu – the Italian for red and blue. The clubs’ emblems offer a unique perspective into the rivalry that has galvanised this fixture. Genoa are represented by a Griffin, and Sampdoria by a sailor whose name is Baciccia. Sampdoria supporters often make fun of the Griffin, describing their rivals as Bibini, the local word for turkey. Genoani mock their opponent’s chromatic combination in return by defining their fellow citizens as Ciclisti, the Italian term for cyclists. Why? From their point of view, only a cycling shirt should include as many colours as Sampdoria’s. The mocking of each other – sets of fans that once described themselves as each other’s cousins – have continued throughout the years. Indeed, there was once a time when who you supported was largely governed by what neighbourhood you grew up in. Although this practice has waned in recent decades, there are still club-centric strongholds dotted around the city. It’s the close quarters that people live within that makes losing the derby such a chastening experience. One loss will reverberate until the next derby takes place. Fans who visit the local fishmonger, for example, will often be called Menaggio, the local term used to satirically mock someone. Famously, after Genoa won the 1990 derby against Sampdoria courtesy of a Branco free-kick, fans from Sampdoria were sent Christmas cards with a picture of Branco’s match-winning effort. Although the rivalry is fierce, it’s rooted within families and this ensures that tensions often play themselves out in jovial ways. Indeed, on-field performances ultimately provide the greatest ammunition. While Genoa fans will argue that a real native must be born a Genoana considering they were founded 53 years earlier, Sampdoria fans will take the line that they have seen success with their own eyes, unlike vicariously through their grandfathers’, as is the supposed case with Genoa supporters. The fact remains that while Genoa might be the elder statesman in the city – and that surely counts for something – Sampdoria have widely been regarded as the better football team of the two. Despite neither side ever challenging the monopoly of Serie A by the established goliaths of the domestic game, Sampdoria’s trophy cabinet is packing a greater punch that Genoa’s. Following the arrival of Enrico Preziosi in 2003, the current Genoa president, something changed. Genoa have become competitive again and there has been a sort of Copernican Revolution in the outlook of the city’s supporters. Previously, the Rossoblu fans could only stress their grander history, while the Blucerchiati focused on the present. During the Preziosi era, however, they have changed their role: Genoani have started to underline their recent results in Serie A and in the derbies, whereas Sampdoriani have started to recall the historical statistics to their ‘cousins’. It highlights how intensely football fans – from all cities – will work to back their beloved colours. Another difference in the relationship between the two is the Stadio Luigi Ferraris. Inside this brick cavern sit Gradinata Nord and Gradinata Sud, the beating hearts of Genoa and Sampdoria supporters. The Rossoblu are intimately linked to the stadium, built in 1911 and named after a Genoa star who died during the First World War. Sampdoria, on the other hand, have recently proposed the building of a new stadium in the city under Riccardo Garrone’s presidency. It’s for these reason that the Genoani usually define their cousins as “guests”. Despite Genoa having a lengthy history that favours their early establishment, Sampdoria lead the way in head-to-heads with 35 wins to 24 losses. For Samp, the season in which they achieved their most crushing result was during 2002-03, with three wins in three different derbies in Serie B and the Coppa Italia, for the first time in their history. They were driven to Serie A promotion by coach Walter Novellino and by the offensive line composed of Fabio Bazzani and Francesco Flachi. Genoa, however, have enjoyed a golden era in Derby della Lanterna recently; the Griffins achieved five wins in six derbies in three seasons from 2008 to 2011, with 10 goals scored and only three conceded. At the end of both of these seasons, the respective rival suffered relegation, which was celebrated by their opponents with an ironic funeral procession. The most dramatic derby in recent years was the second round fixture in 2010/11 season, in which Genoa achieved an extra-time win in the Serie A third-bottom play-off fixture thanks to Mauro Boselli’s goal, that ultimately led to i Blucerchiati facing an almost certain relegation to Serie B. Former Sampdoria striker Éder has been the player in recent years with the largest number of goals in derbies (three). But it’s Argentine striker Diego Milito who became the first player to score a hat-trick during a Derby della Lanterna, in 2008/09 season, with the Genoa shirt in its 100th derby, the year before he won the treble with Inter. 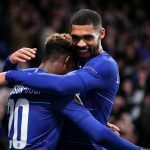 So what about city’s native players? Even if the city of Genoa has never been a traditional hotbed of talent, both clubs have had players heavily involved in the derby. The first Sampdoria captain, Bruno Gramaglia, was born in Genoa as, ironically, a Rossoblu supporter. The other most famous Blucerchiati native-born players are Enrico Chiesa, Roberto Romei, Marco Lanna, Domenico Arnuzzo, Enrico Nicolini, Franco Rotella, Stefano Eranio and Roberto Pruzzo. The history of Genoa derby includes important betrayals too. Giuseppe Baldini, Paolo Barison and Eddie Firmani were the first examples. Baldini, who holds various records in the derby, spent four seasons with Sampdoria before moving to Genoa in 1950 for only a year, returning to Baciccia after two seasons. Barison was a Rossoblu player for two years before being bought by Blucerchiati three seasons after his farewell to the Griffins. Firmani spent three seasons with Samp and two with Genoa between 1955 and 1963. In modern times, how can the Genoani forget Vincenzo Montella? He became famous wearing Genoa’s shirt and is remembered by the Rossoblu for his wonderful bicycle kick against Port Vale in 1995 Anglo-Italian Cup final. However, the Neapolitan striker betrayed the Griffin by moving to Sampdoria after a stint with Empoli. That’s not all: on his debut with Blucerchiati he scored a double against – you guessed it – Genoa in a Coppa Italia tie, flying towards the Gradinata Nord with his characteristic aeroplane celebration. Genoa also had its own shirt-changer, and his name was Andrea Carparelli. Raised in the Sampdoria academy and born in Finale Ligure, a small city almost 75 kilometres from Genoa, he decided to move away in order to find first-team football. 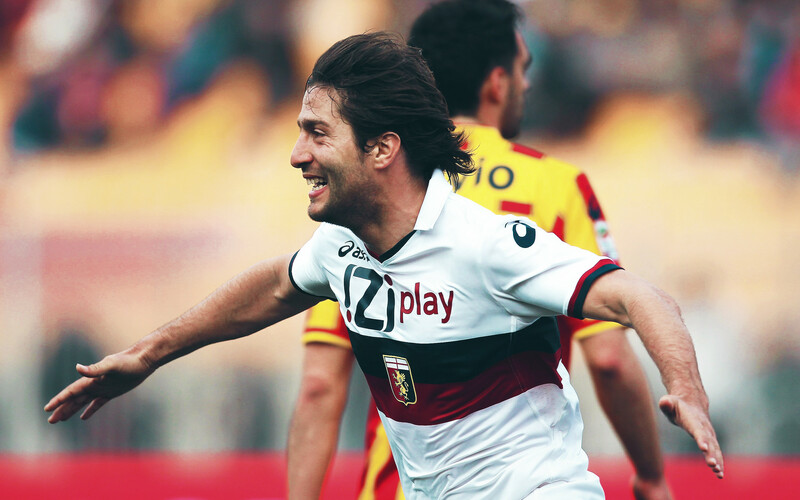 After a season with Empoli, he accepted the Genoa’s offer and signed for them, repudiating his previous experience. 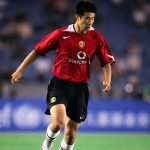 He would end up making a decisive contribution in the 2000 derby thanks to his winning goal in front of the Gradinata Nord. Despite the accusations of betrayal and lost loyalty, only one player has shared the universally same opinion by both sets of supporters: Francisco Chagas Eloia, known as Elói. The Brazilian midfielder, bought by the Rossoblu in the 1983-84 season, was welcomed with open arms by a group of 5,000 Genoani at the local airport. People said that he was able to juggle with a lemon, so the fans were looking forward to seeing him at the Luigi Ferraris in the Griffin shirt. The hype was comforting but history would write a very different story. 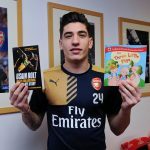 The Brazilian demonstrated an inadequate attitude towards working for his team-mates on the pitch – a famously Genoan trait – becoming an object of mockery by both sets of supporters because he was perceived to have walked akin to a monkey. The first round derby that season is now remembered in collective memory as the ‘Monkey Derby’. When the stadium MC finished announcing the Genoa squad, two Sampdoria supporters near the pitch began to walk hand-in-hand with a monkey borrowed from a circus. The monkey was wearing the number 10 Genoa shirt, that of Elói. The reference was immediately clear and well-remembered even to this day. In their 70 years as neighbours, the Genoani and Sampdoriani have strongly rejected the idea of a merger. Some people have stated that two football teams in a city of 600,000 is too much, that by merging they could form another northern powerhouse. One of the most famous attempts at merging was the exhibition game played by a selection of Genoa and Sampdoria stars against Pelé’s Santos in 1966. In reality, however, Genoa boasts two teams with vastly contrasting histories and ideologies. It’s a city defined by two teams. That notion is highlighted best by the fact that 35,000 people in a city of 600,000 own season tickets – with almost 60,000 watching their team on a weekly basis. In a city that lives football, it’s a rivalry that is needed in Italy. While other games are characterised by violence and animosity, the Derby della Lanterna is all about divided families fighting it out for 90 minutes in the hope that their beloved side will give them something to shout about. It’s what a rivalry should be in football: passionate, loyal and largely friendly. After all, isn’t that the fair play values that our sport was built upon?